In 2009 I saw a call for art for an exhibition called: Travelling Light at the WW Gallery London. They wanted art that could fit into a large envelope. I was conscious that my art was concerned with desire yet I had produced few images of men, so I produced “Treasure” which was inspired by the escape maps of World War II. Servicemen were given cloth maps to help them escape behind enemy lines – the maps could be concealed in a small place, did not rustle suspiciously and could even survive immersion in water. I appropriated this idea to produce a fetish or ritualistic image, mischievously indicating the female gaze. The cropped image of a man’s chest unfolds to almost 2 metres in width. 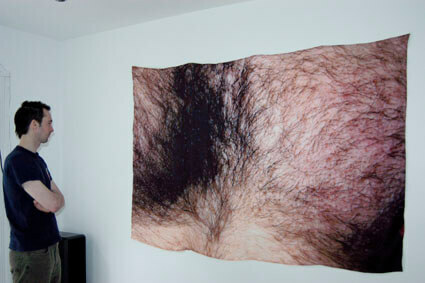 Only once pinned up and seen from afar does this mass of male body hair reveal the form of the chest. The man may have giant proportions but he is easily folded and packed away. Treasure led to making: For your Eyes Only. Images of men printed on silk for personal consumption.